I am a big fan of Asparion software on the Windows Store. But this one is one I particularly like. I have been looking for a good clock tile for my Windows Start Screen, to compliment the weather and news tiles. As McAkins noted on a recent post, the Start Screen is a true dashboard with Windows 8.1. A clock is essential for any dashboards. Well, I am pleased to say that I have finally found a great tool for the job! 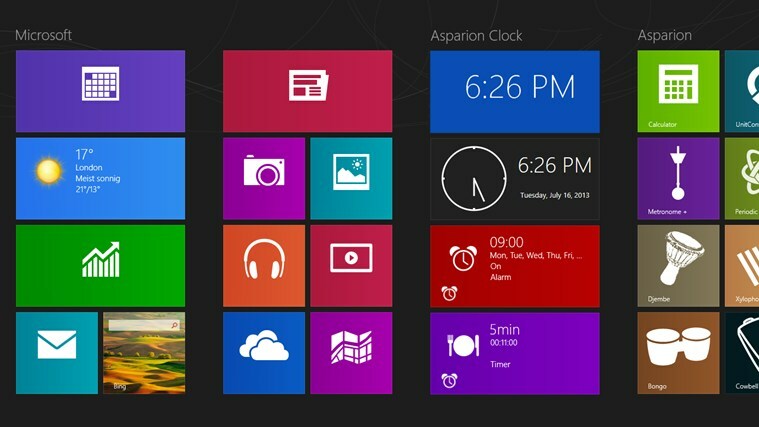 Asparion Clock is an app downloadable from the Windows Store that allows you to place one or more customizable clock tiles on your Windows Start Screen. You can add many clock tiles to your Start Screen, each with different time and appearance. You can have the tile display your System Tile (which you can set from the PC settings interface), or you can use a custom time. Each tiles can have a different look as well, with some being digital clocks and other being variants of analogue clocks. Of course, Asparion Clock is useful as an app itself. You can have multiple clocks set up and view them from the app. The app is also customizable, allowing you to configure the app with any foreground and background color. You can even configure the snapped mode for the app! The app has timer and alarm features as well, if you are interested. However, I personally use it for the live tile feature because the alarms and timer are built in to Windows 8.1.